The little chest came from a yard sale, and with a fresh coat of white paint and glass pulls it looks new. The bottom two drawers hold some of my sterling silver pieces and larger serving trays that are not used everyday. The top drawer is a catch all drawer, that actually should get cleaned out soon. I made the chalkboard (actually I "supervised" while my Dad made it for me) with a thin piece of MDF and 4 pieces of molding leftover from a house he is building. With a few coats of chalkboard paint on the MDF, some wood glue and nails to attach the frame and its ready to hang. 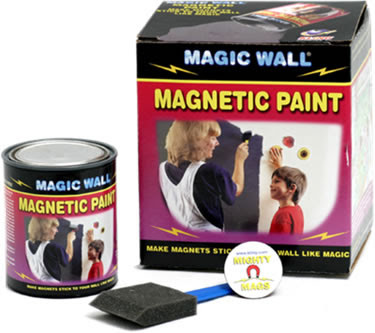 I didn't use this magnetic paint on mine, but I'm totally wishing I did- you just paint this under the chalkboard paint and then it can also be used with magnets to put up those invitations and other items you need to keeps as reminders. 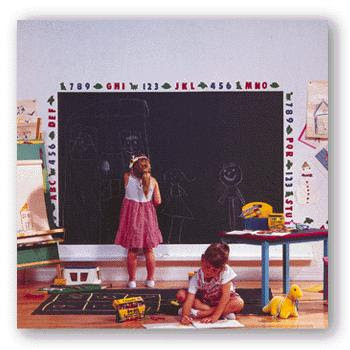 When the time comes to have a "playroom" in my house, I will definitely be doing a chalkboard / magnetic wall. How fun would it be to be able to draw right on the wall and hang up your very own art. I would frame out the wall with molding though, and not the numbers and letters like here. I also would buy a bunch of plain picture frames, paint them to match the decor, take out the back and the glass and attach 4 strong magnets to the back so the kids could frame their own artwork on the wall. How cool would it be to have a gallery wall of your kids art? Give yourself a pat on the back for a job well done! Oh love it. We are totally on the same page. 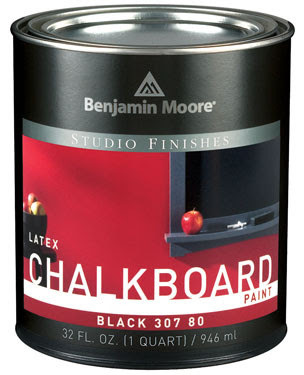 I bought chalkboard paint last week and I'm going to be using it one of my kitchen doors. That is my project for this coming weekend. hhfitd- you should totally get the magnetic paint too, that stuff is awesome! I'm so mad at myself for not getting it. I've seen it used on the inside of a spice cabinet door, and then you can use those magnetic spice holders right on the door- saves alot of space. Anyways, post pictures of your finished project.